Raise your hand if you are over winter? I don’t think my daughter has went to school a full week since Christmas (except maybe one?). Here in the south, we are just not cut out for rough winters, so when they come upon us we are shut down for a while. I got so excited when I went to a store this week and saw (gasp!) springy merchandise. It motivated me to try a little quick spring craft of my own. 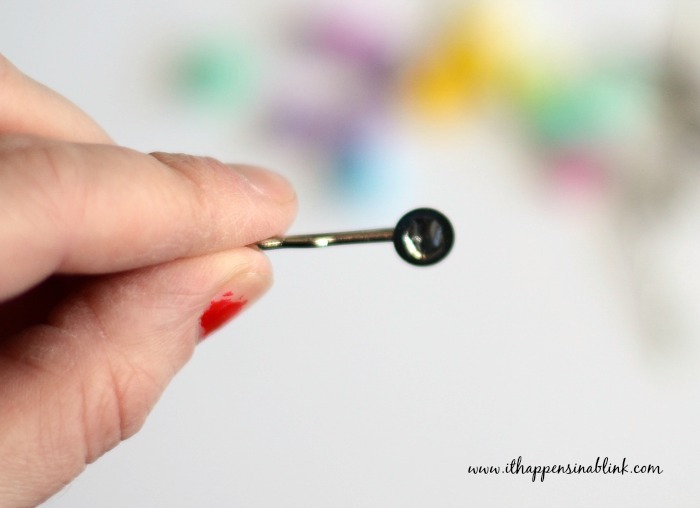 Got five minutes and a few craft supplies? 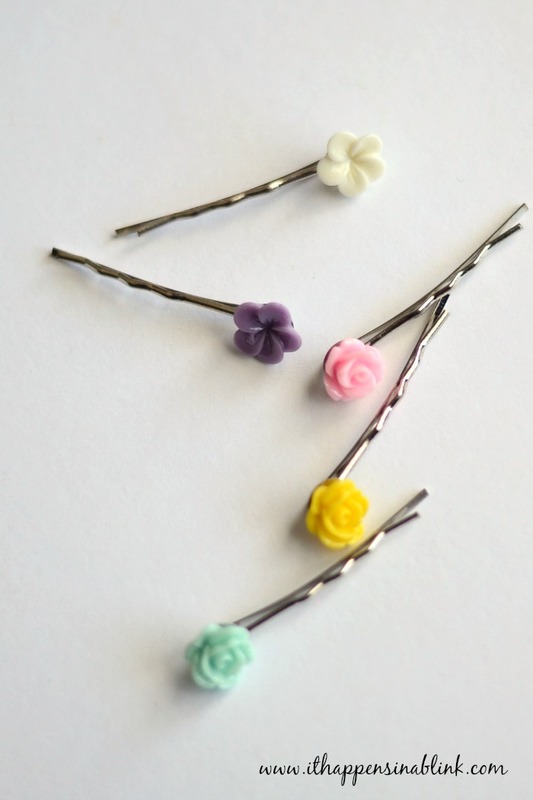 Then you have time to make these Five Minute Hair Pins. And when you’re finished, check out the other amazing spring projects from a few of #myfavoritebloggers. Hey, if nothing else, we maybe we can craft up some spring. 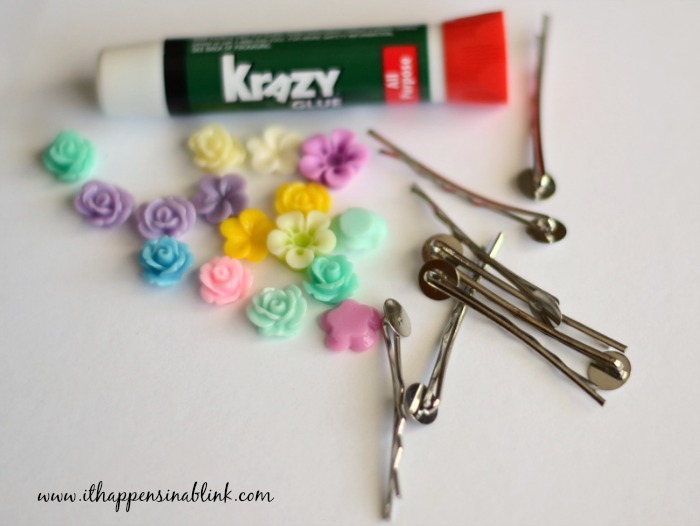 Jewelry Glue or Krazy Glue- I used Krazy glue just because it’s what I had on hand. I order my hair pins and cabochons from Pick Your Plum whenever they are on sale. Begin by dabbing a small about of the glue in the middle of the flat hair pin part. Don’t put too much so that it doesn’t ooze all out over the pin. Wearing chipped finger nail polish is totally optional. Press the flower cabochon on the glue. Hold it for approximately 30-60 seconds until the glue holds. Let dry. Whip up some more. Dream of spring. 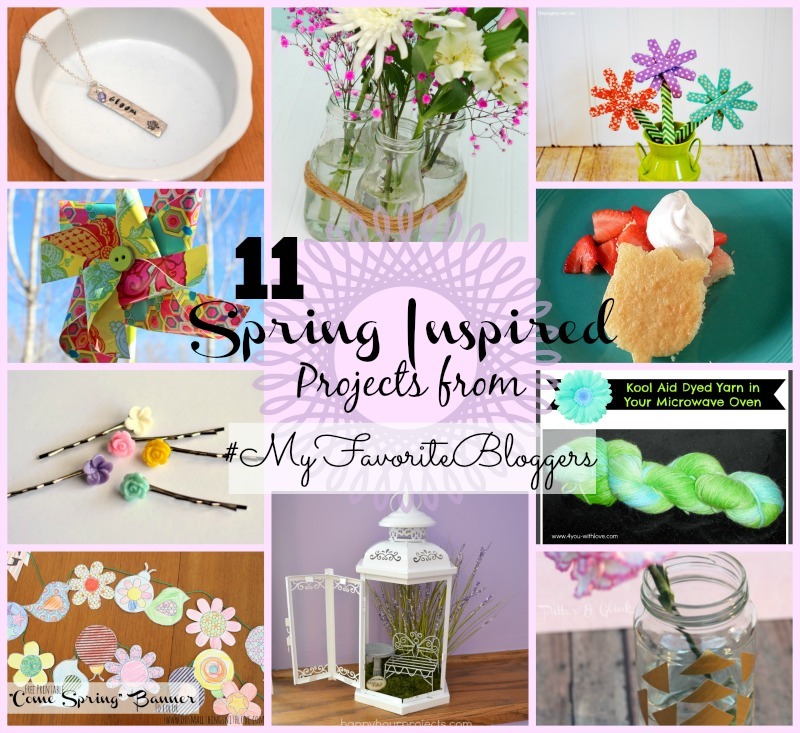 I’d love for you to check out some of the other spring inspired projects that my friends, #MyFavoriteBloggers, came up with! From top down, left to right: Stamped “Bloom” Necklace from One Artsy Mama, Spring Centerpiece from Happy Go Lucky, Washi Tape Popsicle Stick Flowers from The Benson Street, Simple Circle Pinwheels from Creative Capital B, Semi Homemade Strawberry Shortcake from Seven Alive, Five Minute Hair Pins from It Happens in a Blink and Suburble, Kool-Aid Dyed Yarn in Your Microwave from 4 You with Love, Color-able Free Printable Spring Banner from Do Small Things with Love, Fairy Guesthouse from Happy Hour Projects, and Geometric Print Vase from Pitter and Glink. Melanie I am raising my hand as high as I can…..I am so over winter! 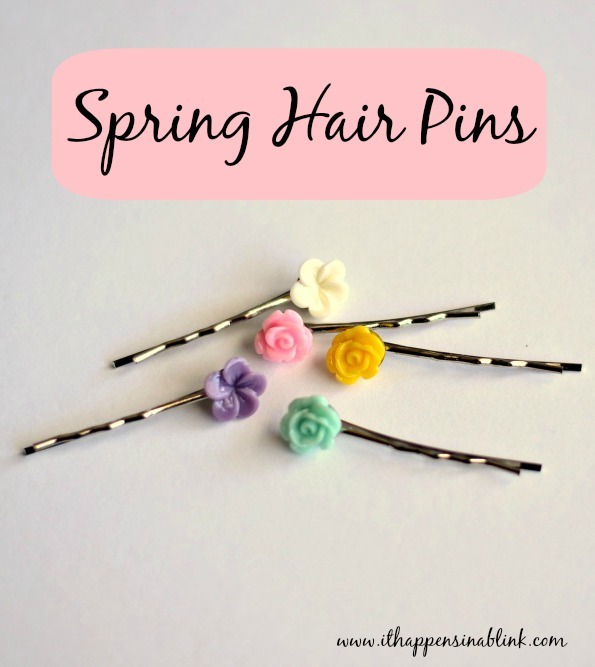 I love these bobby pins…..they really can be made in a blink and they are so fun and colorful! I love the variety of cabochons you have! So lovely! So who’s wearing them in your house? You or your little one? I am so ready for Spring here, too! I have some of these too and have been thinking of making the hairpins. I don’ t know what the heck is holding me up, but thanks for the inspiration! I know- they are so easy! But I had mine for several months before doing anything with them. Love these! They look so fun and easy! 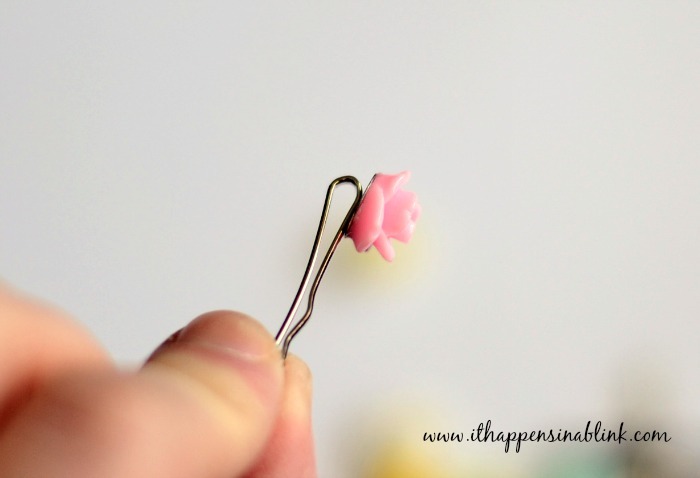 Do you know where else to purchase those adorable flower cabochons? I have a friend who orders them from etsy.